Could Apple Inc. Be a Millionaire-Maker Stock? The company has a magic touch with consumer products and services. 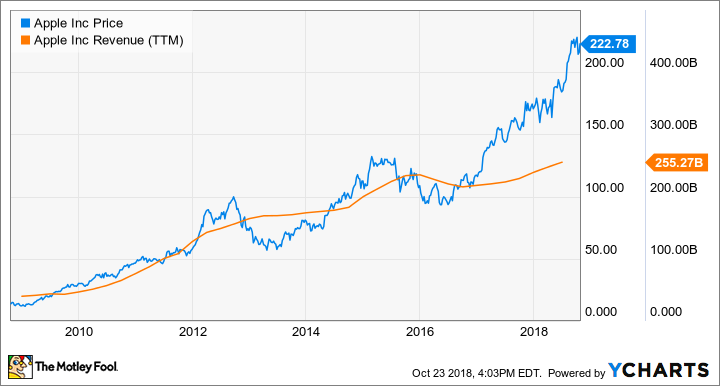 Apple's (NASDAQ:AAPL) market capitalization recently hit $1 trillion, which naturally leads to the follow-up question of whether the iconic brand has reached its ceiling or will continue to add trillions of dollars more to its market value over the long term. Over the last decade, the growth of the iPhone is largely responsible for driving Apple stock up 1,500% to reach that milestone. But over the last few years, smartphone unit sales have started to dramatically slow down, which could severely limit the company's growth potential. Given that the Cupertino, California-based company is still heavily dependent on iPhone sales, what does this mean for Apple going forward? Can the stock still make you a millionaire if you buy the stock? Let's find out. Apple isn't growing at quite the torrid pace it did several years ago when the iPhone and iPad were relatively new products on the market. The smartphone market has dramatically slowed over the last few years, which reflects a slowing pace of innovation, a lengthening replacement cycle, and a potentially saturated market. This has made it more challenging for Apple to grow the top line since the iPhone currently makes up 64% of revenue. But despite low single-digit growth in iPhone unit sales this year, Apple has managed to deliver strong revenue growth as management shifts its strategy to increasing selling prices and growing its services category. Through the first three quarters of fiscal 2018, higher selling prices for the iPhone X helped drive a 15% increase in Apple's total revenue. Further boosting Apple's top line is a huge installed base of 1.3 billion devices (as of the first quarter of fiscal 2018), which is beginning to translate to growing demand for services, including Apple Pay, Apple Music, AppleCare, apps, and iCloud storage plans. Revenue from services grew 30% year over year through the first three quarters of fiscal 2018 and made up 20% of Apple's revenue. Management expects services to reach $50 billion in annual revenue by fiscal 2020 -- double the amount generated in fiscal 2016. Specifically within services, the Mac maker has a huge opportunity in mobile payments since its Apple Pay service works seamlessly across all of its devices and operating systems. In the last quarter alone, Apple Pay processed over 1 billion transactions, which is triple the amount from the year-ago quarter. One analyst estimated that Apple Pay has 253 million users worldwide, which puts Apple neck-and-neck with PayPal Holdings -- one of the leaders in digital payments, which has 254 million users and a market cap of about $100 billion. In addition to mobile payments, Apple is beginning to put the pieces together for a possible streaming service through Apple TV that could be worth $37 billion, according to one analyst. Apple saw strong growth in Apple TV after updating the device for 4K video resolution a year ago. Investors should also be aware of Apple's ambitions in self-driving cars, which is an exciting moonshot opportunity. We know Apple is testing autonomous cars, but it's unclear whether Apple is thinking about the software side or going full throttle with an Apple-branded car of its own. Given Apple's knack over the years for creating products that are beloved by hundreds of millions of users and given that the car is gradually becoming the computer of the future, I wouldn't doubt Apple's ability to make a big splash in the automotive market over the next decade. If there was one company that could bring a fresh perspective on what an autonomous car could be, it would be Apple. Will the stock make you a million bucks? These results may not last for long. While Apple can keep iPhone revenue growing robustly in the near term with strong price increases, the recent 19.5% increase in average selling prices for iPhone in the third quarter is unsustainable. At that rate of growth, consumers would be spending more than $4,000 for an iPhone in 10 years. Given that unlikelihood, average selling-price growth should gravitate down to the single digits over the long term. Analysts estimate Apple will grow earnings about 12% per year over the next five years, which seems to fit this scenario. Slowing iPhone revenue growth should be compensated by the faster-growing services category, which all together should leave enough growth to deliver solid gains for shareholders. It probably won't make you a millionaire, but Apple shares should keep marching higher over the long term.